With your Microsoft Account, you can create a Family Account to "to help manage your kid's online activity". Block websites - You can make sure that adult websites are blocked for the kids in your family. You can block specific sites, too—or choose which sites you want your kids to see. Play time is important. Let them have fun, safely - You can allow your child to download apps and games appropriate for their age, and still make sure they don’t get anything they’re not ready for yet. A window into their digital life - Get recent activity reports on sites visited, apps used, games played, and screen time. Or, check in online anytime. Set good screen time habits - Together, you can talk about good habits and set limits on how much time they can spend with their screens. A excellent concept, except for one problem: the Family Account is limited to 3 children and 2 adults. We have 4 children. There are a number of Community Form Threads about this issue. Microsoft: "What that means is that you have the reached the maximum amount of persons that can be added, hence the reason why you are getting that message." Me: "So how do we fix it? How do we upgrade out account? You can't be serious in thinking that an acceptable answer is one of our kids just can't be part of our family?" Microsoft: "Unfortunately once you are receiving that message then there wouldn't be anything that can be done with regards to changing the number of persons that can be added on the account." 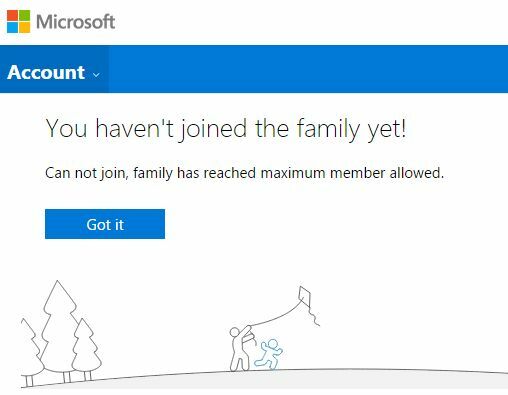 Me to my daughter: "Microsoft says we have to disown you, because you can't be a part of our family." Microsoft then forwarded me onto another tech support, who then forwarded me to billing, who then forwarded on again in a great big circle. One community member found a ugly workaround that if they remove the second parent, they can add a 4th child. There is currently no workaround for families with 5 or more children.